Sure we love numbers, and we love working through problems, but we are mostly a visual group. We draw pictures, boxes and lines on the whiteboards to work through problems. It is so much easier for everyone to see in colors and lines how a project is doing than looking for a green, yellow and red numbers on a long list of tasks. There is a place still for our spreadsheets, as there is a place for our project plans, but projects start and track so much quicker when they are done with a Gantt Chart. Till today, this has meant we did those on our notebooks and desktops then transferred HTML versions or images of those charts to reference on our iPads when buzzing through our day. 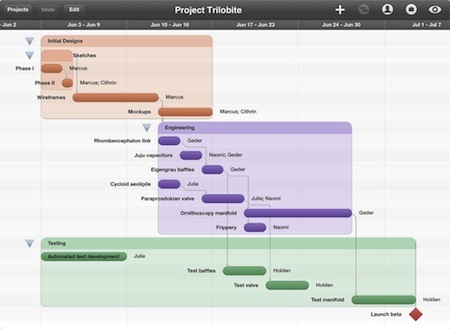 The folks at OmniGroup have ‘finally’ released a version of OmniPlan specific for the iPad… happy days! 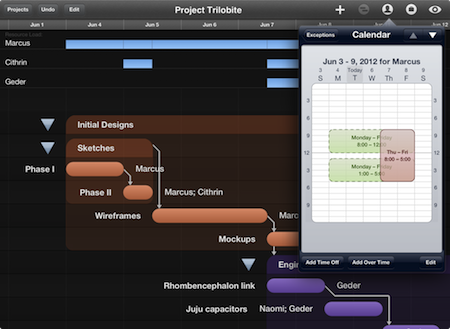 If your new to Gantt Charts, it is a world of people and effort being lines across time. Software like OmniPlan let you assign people to effort lines and state how long that effort should take. You can then assign how much of that person’s time should be on which effort if they are able to split their time or need their full attention on one item. Lines can be dependent on another or to several items needing to be completed. There is no need to hunt about to make sure a person isn’t being double tasked and if they are, where. OmniPlan shows very quickly either by alerting your or by adjusting the plan timeline how people and effort will all lay out. A effort goes long, simply drag the line to the new ‘done’ date and the rest of the plan reflows. Add a person to an effort and everything adjusts as the previous individual’s time is spent elsewhere so the project flows differently across linked efforts. And of course, with OmniPlan, everything has colors and notes so at a glance you can see people or the types of work across the time of the project. We have only spent about 12 hours with OmniPlan on our iPads so we aren’t willing to do a full deep dive review yet, but we can say it has lived up to everything we have needed it to do so far. First, we synced the charts we already had done on our computers, moved a few things around and synced back, all good. Tracking is supported so we had people make changes on the iPad and changes on the computer then accepted and rejected those changes on the plan that was then shared with everyone else. With Filtering and Alerts (OmniPlan calls them ‘Violations’), it is easier for an individual to see what they have to get done and how it relates to other people working the project tasks. Of course, once you own an app like OmniPlan, it creeps into your home life too. Why not time out everything that has to be completed before a vacation trip, or before kicking off the back deck project. You, and other family members, can see what has to be completed in the process and if efforts are being impacted by other things. An individual didn’t pick up the hand rails will mean they won’t be in place for the planned staining weekend when the dog is planned on being at the groomers and not leaving paw tracks across the freshly stained deck. It’s a visual world, now we get to see how things are going and adjust for blocking issues all on our iPad.